Think You're Multitasking? Think Again Don't believe the multitasking hype, scientists say. New research shows that we humans aren't as good as we think we are at doing several things at once — but it also found a skill that gives us an evolutionary edge. Researchers say humans are merely very good at switching their attention from task to task. Swinson anchors the morning and lunch rush at the Tastee Diner in Bethesda, Md., where the menu ranges from pancakes to burgers. And note the lack of tickets: All orders are placed verbally. 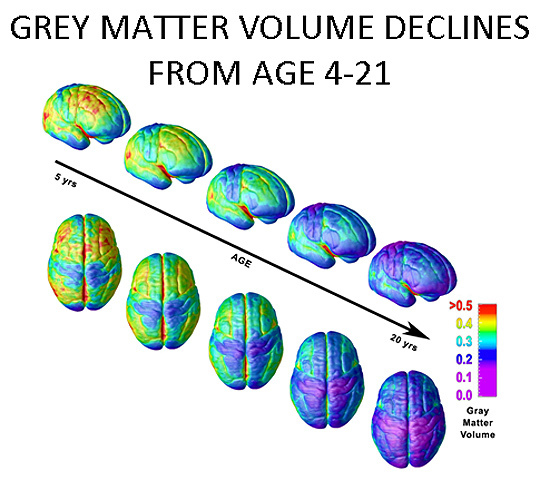 Shown in red, the frontal lobe houses the "executive system" of the brain; it decreases in volume as we age. This region helps the brain decide which tasks to focus on and when to suppress irrelevant information. 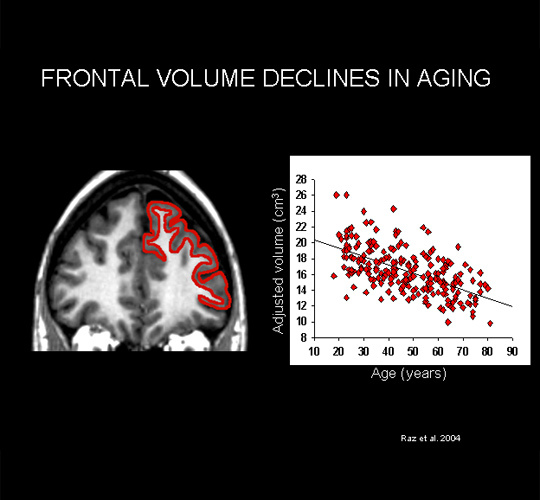 Click to see a graph showing how the frontal lobe changes with aging. 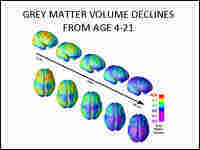 The volume of gray matter, or the neurons of the brain, peaks in the early years of development. As technology allows people to do more tasks at the same time, the myth that we can multitask has never been stronger. But researchers say it's still a myth — and they have the data to prove it. Humans, they say, don't do lots of things simultaneously. Instead, we switch our attention from task to task extremely quickly. A case example, researchers say, is a group of people who focus not on a BlackBerry but on a blueberry — as in pancakes. To make it as a short-order cook, you must be able to keep a half-dozen orders in your head while cracking eggs, flipping pancakes, working the counter, and refilling coffee cups. And at a restaurant like the Tastee Diner, in Bethesda, Md., the orders come in verbally, not on a ticket. Chocolate chip pancakes, scrambled with sausage, order of french fries, rye toast — they're small tasks. On a busy day, though, they add up to a tough job for Shawn Swinson. "My first month here, I was ready to walk out the door," he said. Asked what it feels like when he's in the middle of rush hour, Swinson said, "Like you're in an insane asylum. It's almost unbearable." Swinson has learned to handle the pressure. He's an island of calm, even when the orders are flying. But Swinson's boss, manager Frank Long, says very few people can keep up without losing their cool. "It's singularly the most difficult job in this type of operation," Long said. "Four cooks. Five waitresses. Bus staff. Host. Getting them in and out." Speed and accuracy are at a premium — especially when the customers are multitasking, too. Lunchtime is the worst, Long said. "People may have an errand to run. Maybe go to the bank and pick up dry cleaning, and eat. All within an hour, whatever time they have." It's all part of life these days. We answer e-mails while yapping on the phone. We schedule appointments while driving and listening to the radio. And it seems as if we're focusing on all these tasks simultaneously, as if we've become true masters of doing 10 things at once. But, brain researchers say, that's not really the case. "People can't multitask very well, and when people say they can, they're deluding themselves," said neuroscientist Earl Miller. And, he said, "The brain is very good at deluding itself." Miller, a Picower professor of neuroscience at MIT, says that for the most part, we simply can't focus on more than one thing at a time. Researchers say they can actually see the brain struggling. And now they're trying to figure out the details of what's going on. At a lab at the University of Michigan, researchers are using an MRI scanner to photograph test subjects' brains as they take on different tasks. During a recent test, Daniel Weissman, the neuroscientist in charge of the experiment, explained that a man lying inside the scanner would be performing different tasks, depending on the color of two numbers he sees on a screen. "If the two digits are one color — say, red — the subject decides which digit is numerically larger," Weissman said. "On the other hand, if the digits are a different color — say green — then the subject decides which digit is actually printed in a larger font size." The tests can be tricky — which is the point. After an attempt, the technician told the test subject, "OK, do the same thing, except try to go faster this time." 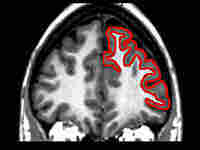 MRI studies like this one, Weissman said, have shown that when the man in the scanner sees green, his brain has to pause before responding — to round up all the information it has about the green task. When the man sees red, his brain pauses again — to push aside information about the green task and replace it with information about the red task. If the tasks were simpler, they might not require this sort of full-throttle switching. But, Weissman said, even simple tasks can overwhelm the brain when we try to do several at once. "If I'm out on a street corner and I'm looking for one friend who's wearing a red scarf, I might be able to pick out that friend," Weissman said. "But if I'm looking for a friend who's wearing a red scarf on one street corner, and in the middle of the street I'm looking for another friend who's wearing a blue scarf — and on the other side of the street I'm looking for a friend wearing a green scarf — at some point, I can only divide my attention so much, and I begin to have trouble." So the brain starts switching. Scan for red. Switch. Scan for blue. Switch. Scan for green. Switch. The part of the brain that does this is called the "executive system." It's a bit like one of those cartoon conductors telling the orchestra: louder, softer, faster, slower. You come in here. You be quiet for a few measures. The conductor in our heads lives in the brain's frontal lobes, basically above our eyes. "Executive processes allow us to make plans for our future behaviors," Weissman said. "They allow us to exert some sort of voluntary control over our behavior." The executive system also helps us achieve a goal by ignoring distractions. And the brain's executive will keep us in that mode until we hear, say, one of our children screaming. Humans are also not like cats, or dogs, or even apes, when it comes to controlling how our brain responds, and what it responds to. Weissman says this skill probably evolved to help humans — who are pretty vulnerable, physically — to do things like hunt animals that are bigger and stronger. "As hunters, you know, people had to hunt something, and keep track of where their friends were," Weissman said. "You've got to think about, 'What is that tiger going to do?' you know, and, 'I've got my group of friends' — and surround the tiger." Weissman says that keeping track of all those things wouldn't be possible without the executive system in our frontal lobes. Still, Weissman said, "There are lots of animals in the world that hunt without these increased abilities. So I wouldn't say that to hunt you have to have a lot of frontal development. "But on the other hand, it helps. That's why humans have become dominant on the planet." Dominant — and, perhaps, too confident in our own skill. Studies show that we frequently overestimate our ability to handle multiple tasks. For early humans, that sort of miscalculation could have meant becoming a tiger's lunch. These days, the consequences are more likely to be stress, a blunder — or maybe a car crash.